New president to be named: The Board of Trustees will meet at 10:15 a.m. Friday at the Nittany Lion Inn to discuss what this legal notice calls “a personnel matter.” There’s only one “personnel matter” that requires this kind of preparation and special meeting—the naming of a new president. According to this story in the Centre Daily Times, which published the paid legal notice, there are also executive sessions of the board at 7 p.m. Thursday and 8:30 p.m. Friday. Stay tuned. Obviously, news around here doesn’t get any bigger than this. Paterno family, et. al., vs. NCAA: The next step in the legal process occurred Tuesday, when NCAA attorneys argued that none of the plaintiffs in the lawsuit challenging the NCAA sanctions filed by the Paterno family, various trustees, faculty members, former coaches, and lettermen have standing to sue the organization. It’s a complicated case; Senior Judge John Leete said, according to this story from the Pittsburgh Post-Gazette, that the case has “more citations than any case I’ve seen in 26 years.” You can tell how complicated it was by the different ways reporters wrote their stories. Paul Kelly, a lawyer for the Paterno family, told the story of how the vacated wins, particularly harmed lettermen; the tale of one of the lettermen’s sons is laid out in this CDT story by Mike Dawson ’02. Peter Hall of The Morning Call in Allentown wrote a piece that focuses more on the NCAA’s argument, that Penn State president Rod Erickson accepted the sanctions to avoid worse penalties and that the judge can’t invalidate the sanctions without giving the university a chance to weigh in. Leete did not indicate when he would announce a ruling. 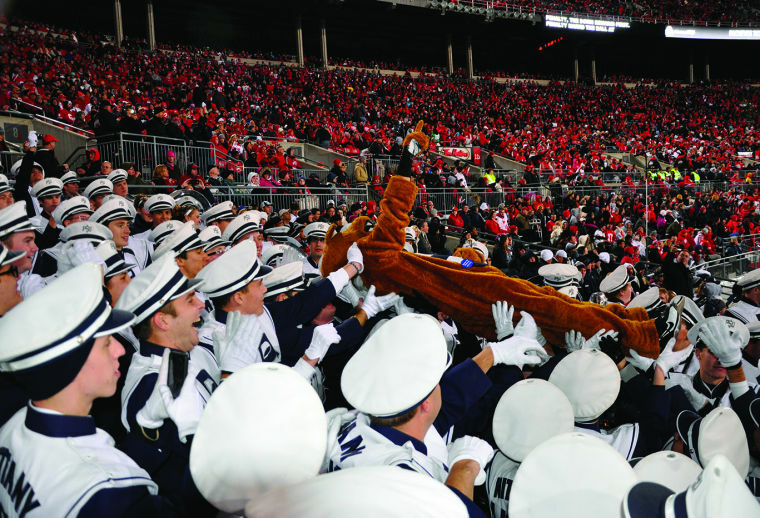 This Daily Collegian photograph shows the game — and the Lion — from the band’s perspective. On a lighter note: A Collegian reporter tagged along on the Blue Band’s trip to Ohio State over the weekend and filed this report in Tuesday’s paper. I absolutely loved the story of the sousaphone player who was so overcome for her first pregame in Beaver Stadium that she couldn’t play her instrument—she was crying that hard. But she marched—and as the band members explain to the reporter, that’s what counts. A fun piece. Finally. It’s time for wrestling season: During the wrestling team’s preseason media day Tuesday, coach Cael Sanderson said, “For the most part I don’t think we really have many guys…if any, that are completely satisfied with the way things ended even last year,” Sanderson said. “There’s a lot of motivation for our guys.” Quick review: Last season the wrestlers won their third consecutive NCAA title, put five wrestlers in the NCAA finals, and had two undefeated NCAA champions. That kind of attitude, I think, goes a lot way toward showing why the wrestlers have excelled recently. For insight into Penn State’s two biggest names, two-time defending NCAA champ Ed Ruth and three-time finalist, one-time champ David Taylor, check out this column from Tim Owen ’11, who consistently delivers some of the best insight into the wrestling program. And if all of this makes you want to watch a match, you’re in luck: Rec Hall is basically sold out, but there are still tickets available for the Dec. 8 match against Pitt in the Bryce Jordan Center. Entry filed under: Board of Trustees, Penn State in the News. Tags: Blue Band, NCAA lawsuit, presidential search. Im a sophomore at Penn State University park and have season tickets to the football games. Last year as a freshman I just dressed in my White Out shirt, white pants, white armbands, and a white hat. Obviously being a freshman you dont want to look stupid or “uncool” to the upperclassmen so you just go basic. Well after watching what the upperclassmen did last year I want to be one of them and go above and beyond. Some examples of what students did were: authentic Stormtrooper armor with PSU stickers on it, a yeti costume, the usual painting of the chest, skull masks, white santa costumes, etc etc. If youre a real penn stater and know exactly what would be cool to do, or you just have a great idea I would really appreciate it. I’ve got some of my own ideas but I wanna hear what you have to say!! !